This issue’s cover illustration is from Supertato Veggies in the Valley of Doom by Sue Hendra and Paul Linnet. Thanks to Simon and Schuster for their help with this July cover. By clicking here you can view, print or download the fully artworked Digital Edition of BfK 231 July 2018 . 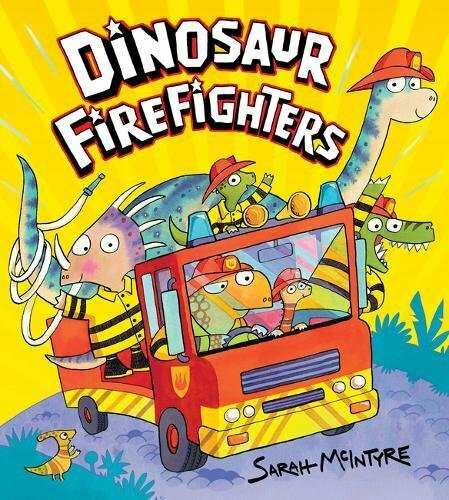 In this picture book for younger children, a giant dinosaur dreams of becoming a heroic firefighter. She is lucky enough to be accepted onto the force and joins Barry Baryonyx and Pablo Parasaurolophus in rescuing cats up trees and dinosaurs in distress. Sadly, being a firefighter takes some getting used to for Dipsy. Dipsy’s gigantic frame and enormous tail cause carnage in Dinoville, despite her best intentions, and some unfortunate catastrophes (including accidentally catapulting a cat!) offer plenty of humour to engage a young audience. She is determined, though, and her helpful dino-friends are soon able to find the perfect role for her on the force. Huge, bold, bright illustrations tell much of this story, and the pages are further enlivened by original uses of fonts and calligrams, with sentences snaking across the page and sound effects exploding out of the action. Dipsy is a cheerful and endearing hero and children will enjoy reading about the trouble she gets into. The story is simple and it is easy to imagine some children asking to hear it over and over again.